Our vision of running an affordable and high-performing National high school catering to vulnerable and dispossessed girls is finally coming to fruition. Our objective is to offer a top-notch education to girls who perform well in school and on exams but who cannot afford to pay the high fees that most high schools charge. We will focus primarily on vulnerable girls whom, if they cannot attend high school, will be forced to undergo female genital mutilation, will be married off by the age of 13 or 14 and will be sentenced to a life of housework with no chance of ever completing their education, finding real jobs, or achieving any of their other goals. Lenana will be a self-sustainable high school, its agriculture, livestock and poultry projects in combination with other services offered, will raise enough capital to cover all of the school's expenses. We have found a 26 acre piece of land in Busia County, close to the Kenya-Uganda border by the town of Malaba. After the initial capital needed to purchase, cultivate and develop the land, and to construct the school, dormitories, playing fields and the like, Lenana will be equipped with the foundation to raise its own capital for school costs and further expansion. The initial round of physical drawings and plans for the school have been completed by one of CGA's volunteers, Krystina Finn, and we hope to begin implementing these plans within the next few months. The plans include an administrative block, classrooms, laboratories, dormitories, washing areas, teacher and staff accommodation, playing fields, a multi-purpose performance space, a museum, fields for crops, livestock and poultry, and a services block where services such as phone charging, a salon, a convenience shop and the like will be offered for purchase. This is an exciting step for Lenana Girls as we now have concrete plans for a project that has been a vision of ours for years now. We have begun raising the initial capital needed to begin construction. We have a variety of options for our supporters to consider. Depending on the amount of the donation, we have options including having a classroom or school wing named after you, commemorative trees planted in your name, bricks on our walkways engraved with your names and many other options. We also have products available for sale on our online shop. 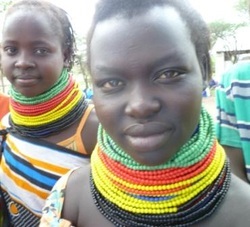 Products include jewelry, fabrics, clothing and other items made by women in nearby Kipsongo Slum. After paying the women for these items, all proceeds will benefit Lenana Girls High School. A cookbook with recipes compiled by CGA's famous chef, Mariam, is also available for sale online with proceeds benefiting the school. To learn more about fundraising options, please visit our fundraising, scholarship and student sponsorship pages.